Successfully Added Jumper Ezbook i7 Laptop PC - Intel Core i7 CPU, 4GB RAM, 14.1 Inch 1080P Display, 128GB SSD, SD, Wi-Fi, BT 4.0, RJ45, USB to your Shopping Cart. The Jumper EZbook i7 is full size and full power laptop. The front is dominated by a full HD 14.1-inch display with a 16:9 aspect ratio. The screen has good brightness and wide viewing angles so viewing is enjoyed without losing any real contrast or color saturation even when not viewed head-on. As this laptops name suggest it houses the powerful Intel Core i7 4500U CPU which is dual core clock at 1.8GHz but with the Intel Turbo Boost Technology it can reach speeds of 3GHz which is incredibly fast. The EZbook comes with 4GB of RAM which is fairly decent and if you really do need extra then you can swap this out for 8GB worth of memory in the same slot. When it comes to gaming this or graphic intensive work such as video editing the Intel HD Graphics 4400 GPU has you covered and can clock up to 1.1GHz. With 128GB of SSD storage has lightening quick access speeds so you can access data in the blink of an eye. For extra storage, there is a micro SD card slot that can support and additional 128GB of memory. An English version of Windows 10 comes preinstalled on the laptop so you can get to work right out of the box. For use with a larger display, there is a mini HDMI port so you can plug this Windows laptop into your TV or large screen monitor. There is a large battery to ensure a long usage time and when it comes to connectivity you have the RJ45 port as well as wi-fi and Bluetooth and a USB2.0 and USB 3.0 port for peripherals. 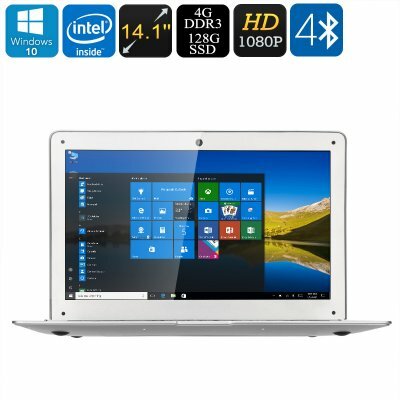 The Jumper EZbook i7 Windows laptop PC comes with 12 months warranty, brought to you by the leader in electronic devices as well as wholesale laptop PCs and tablet computers..